*DISCLOSURE: This post may contain affiliate links, which cost you nothing, but do help to support my website/blog’s maintenance and fees. You can read my full Disclosure statement here. * – UPDATE as of November 8, 2016. When I started making paper flowers, I was the biggest fan of my hot glue gun. Hot glue adheres petals extremely well (sometimes too well, especially when I don’t want it to be secured within 10 seconds! ), is cheap, and easy to use (all in contrast to tacky glue…don’t even get me started). I was the biggest fan that is, until I discovered my favorite floral tape – Darice floral tape. Darice is a wholesaler of craft supplies based out of Ohio, U.S.A. I purchase their floral tape from Golda’s Kitchen, which is conveniently located in my hometown. I had frequented Golda’s Kitchen numerous times to purchase cake supplies, but I had not been aware that they also carried floral tape, floral wire, and stamens. It is obvious to me now as cake decorators would use those same materials when making edible flowers. I was initially attracted to my favorite floral tape by its price per roll ($1.50 for 90′) and then by the colours (available in both dark AND light green), and which you can buy online on Amazon.com in a single roll, 3-pack, 6-pack or 12-pack. Who knew that it was also amazingly sticky and stretchy??? Previously I used Ashland floral tape from Michael’s, however, I had found it stiff to work with; perhaps it had dried out. I personally like it more maleable so I can really tape down the bottom of the flowers to the stems. Michael’s only carried it in a dark green, brown and white. Also, it was pricey for us Canadians: $3.49 for 55′ only. Since the day I started using the Darice floral tape, I’ve been hooked. Instead of using my glue gun, I now use floral tape to adhere most of the petals for my flowers. I love that I can re-do the flower very easily by just unwrapping the tape. It’s also a lot less messy. Hot glue tends to develop these annoying web-like strands that get all over your hands and everything else in its vicinity. The only downside is that this particular floral tape does not tear cleanly. 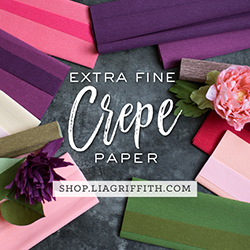 I’m fine with this as I like to use scissors to pre-cut my floral tape anyways, although I know other paper flower artists like to tear their floral tape in order to work more quickly. I also have to admit that there is a moderate learning curve before you will be able to use the floral tape like a pro. At the Paper Flower Arrangement workshop I instructed a few weeks back, most of the participants struggled to use floral tape, even proficiently. It does take a lot of finger strength and dexterity, but it’s not something that you cannot learn, practice, and eventually master. Tip: Just remember to pull the tape as you stretch it across whatever you are taping and it will adhere smoothly and cleanly. I wonder, what is your favorite floral tape? I’ve really enjoyed all your posts on floral crafts. I’m impressed that you can create the paper flowers using solely floral tape. I use a low-temp glue gun which is considerably less painful to use and the floral tape from Paper Mart works well for me. When you packed your flowers for the wedding, did you find a good way to pack them so they would not get damaged in shipping? I haphazardly put about 10-12 stems in my suitcase and they all held out really well. But I need to ship a whole bunch of them for my wedding in October. Any advice you have would be greatly appreciated.